4 All butter scones with Cornish buttermilk and Cornish clotted cream. 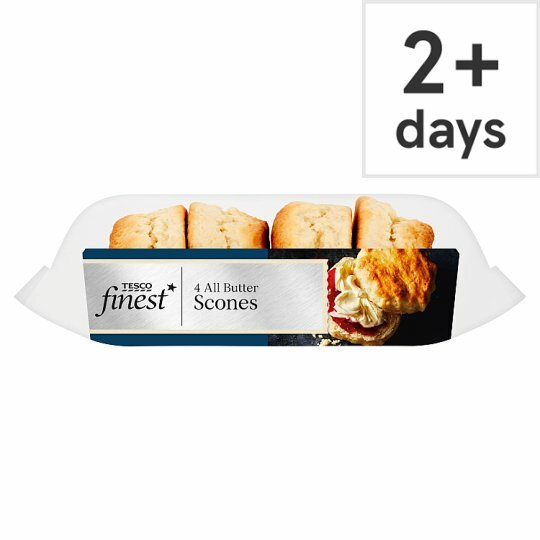 Our Tesco finest scones are made by a family run bakery specialising in scones, using only the very best ingredients. Made with buttermilk and thick, silky Cornish clotted cream for a rich flavour and soft, crumbly texture. INGREDIENTS: Wheat Flour (Wheat Flour, Calcium Carbonate, Iron, Niacin, Thiamin), Cornish Buttermilk (Milk) (18%), Butter (Milk) (14%), Sugar, Cornish Clotted Cream (Milk) (5%), Pasteurised Egg, Raising Agents (Disodium Diphosphate, Sodium Bicarbonate), Salt. Contains milk, wheat and egg. For allergens, including cereals containing gluten, see ingredients in bold.